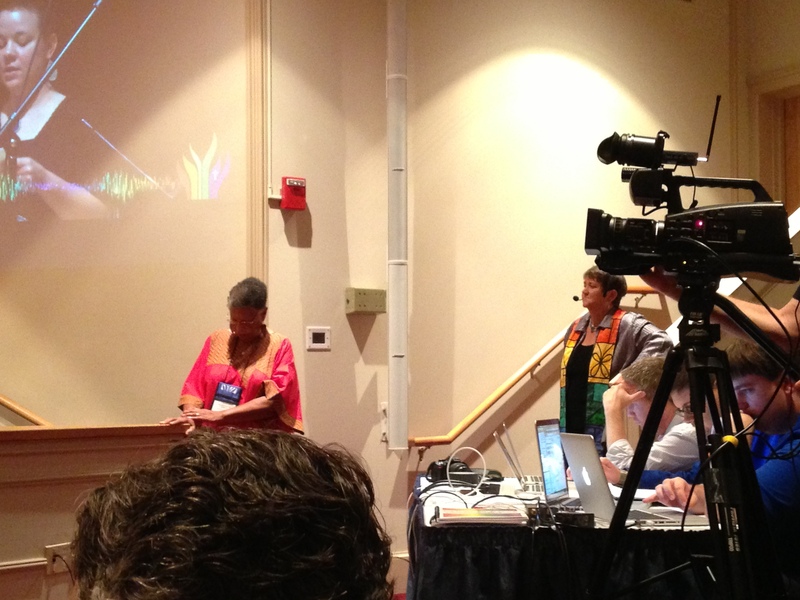 Earlier this month, I attended Reconciling Ministries Network’s biennial Convocation. 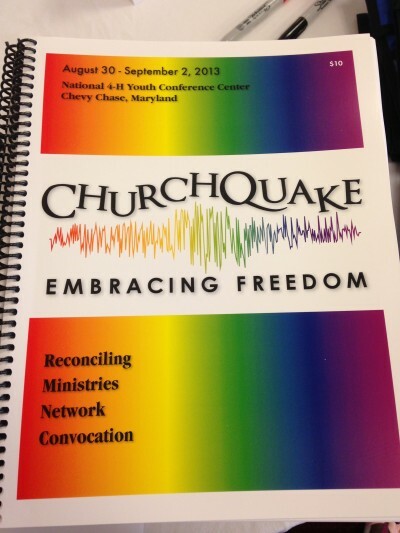 This year’s event, Churchquake!, was held over Labor Day Weekend (hey, I’m trying to fit my thoughts in within the statute of limitations window!) in Chevy Chase, MD, and despite my long love affair with RMN, this was my first time attending Convo. It wasn’t perfect, by any stretch (we’ll get to that in another post), but it was after all a reflection of people in beloved community, so how could it be? 1. The People. They are, of course, the reason I went to Convo, the reason I’m part of RMN, the reason to do anything. The amazing, expansive, imperfect, deeply passionate, powerfully loving people of my progressive, queer, relational church life are incredible. Many folks I met for the first or second time at Convo, and in other cases it was like the best church family reunion ever. 2 . Worship and Preaching. There is nothing quite like the gift of participating in worship rather than presenting it, and knowing that our shared understanding of the Holy is one where I can pray, sing, reflect, wrestle, and live before the God of my understanding without having to defend against language that erases me and my loved ones, distances me from the act of worship, or makes me feel like I have to defend God from the charge that “He” is a sexist, racist, homophobic, vindictive meanie. The preachers (some of whom I caught in person and some online after) were all good, but there’s something extra amazing about receiving the Word from a woman I know in person and deeply love and respect, as was the case for me with both Vicki and Karen. Beautiful. 3. Bible Study. Okay, I know this wasn’t everyone’s cup of tea. Our bible studies were a series of talks and monologues that were part scholarship, part art, and part entertainment. And yes, there were rough patches, and yes there are problems with suggesting that we rename the Book of Esther the Book of Eunuchs– but this is a great jump off place for talking about how minorities often compete for airtime in a majority-dominant place like the bible, and in a justice movement like RMN, so let’s look at how powerful women and sexual minorities vie for space and attention in Esther, and maybe how their struggles overlap and intersect and are at odds with one another (and maybe how powerful women are also sexual minorities?). In any case I like the approach, and I learned things I didn’t know. 4. Challenging Myself. I like learning new things and I like being pushed outside my comfort zone, because how can you learn otherwise? So it’s good that I’m not the most leftist, radical person at Convo, because I can learn new things. This came up especially when I was in a particular workshop, where I went to learn about post-colonialism in the UMC, because I think that’s an important topic in our quest to be a global denomination. But the workshop was a little on the 101 level for me and I got distracted looking at Twitter, where people were posting from the “queer sexual ethics” workshop. Some tweets intrigued me, some made me uncomfortable, and some were things with which I strongly disagreed, the latter two often about poly. I’m kind of all about monogamy, and I know that my approach to polyamory sounds just like the approach to homosexuality I fight against: “It’s just not what I think marriage/relationships/etc are.” So, I engaged in workshop polyamory, and decided it was time to spend time with the queer sexual ethics workshop because it was pushing the edges of my comfort. So that’s what I did. And I’m not going to go seek out poly relationships for myself any time soon (or ever, I imagine), but I learned a lot about new perspectives to me and I think I can be a better ally because of it. I love anything that encourages me to stretch myself. 5. Naming Intersectionality. This was tough, and is a growing edge, but I could really hear the awareness in the RMN leadership and in the way things were presented to try to address the intersections and overlaps of various kinds of oppression and of justice-seeking. It’s sticky and challenging, but we talked about gender and gender identity, sexuality and ordination, and a growing list of how these pieces overlap. We can improve on this, and I hope we do. 6. Coming Home. I don’t mean home to my house; I mean home to a church family I always had and where I was always welcome, but where I don’t get to gather in this way often (or ever before). I have things I’d like to see improved (coming from a place of love and hope), and I’ll post those thoughts soon. Family legend tells that the year after my parents separated, my mom faced the prospect of her first Thanksgiving alone. She accepted an invitation to the home of a friend, and my family and I have been spending alternating Thanksgiving holidays with them ever since, adding spouses and children and new traditions along the way, changing the location but keeping the love and laughter that I have always associated with my favorite holiday. My nuclear family system is undergoing tremendous and unanticipated change. Change of the sadness and separation variety. With my two children spending the holiday break with their father, Thanksgiving represented for me my first long stretch away from my kids since the new visitation rotation started, my first holiday separated from the joys of my life, and my first Thanksgiving without a delightful, warm, amply-set table, packed to capacity with mismatched flatware and ringing with the noise of little people’s laughter. Invitations to each of my parents’ houses did little to ease that pain; the thought of being surrounded by family—but not the family I missed—stung deeply. When I imagined myself with the rest of the guest list, as literally every other person who would be at each gathering spent the holiday with at least one of their children, there was no way I could imagine keeping turkey and stuffing in my belly. Sometimes, family isn’t the place we can be. Or should be. Or is healthy or safe for us to be. Sometimes, when family feels broken, what is really happening is a breaking open. Fortunately, I know and love a lot of people who have a much more expansive concept of family. 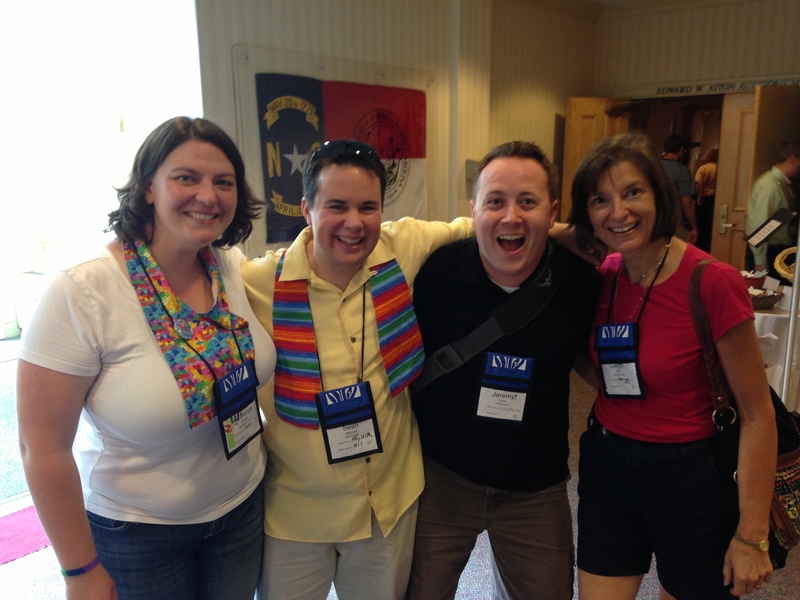 I’m part of this crazy connection of Methodists, and reconciling ones at that. I called a friend, who called a friend, and I ended up with a much more inclusive, broadly defined family celebration than the typical Thanksgiving crowd: four reconciling United Methodists, some good cooking (duck, not turkey), some shared laughter and song (okay only two of us sang), and a supportive space for tears, joy, and rejuvenation. If that sort of feast isn’t a foretaste of the inbreaking of the kin-dom, I don’t know what is. My expectation of the holiday stretch from Thanksgiving through the New Year isn’t born out of magazines and Martha Stewart, and doesn’t need to be picture-perfect. It does, however, include a strong focus on connection and love and family, and I’m experiencing what so many already know: that family is defined by who we love and cherish, the people with whom we set (and clear) the table, the ones who welcome our grief and our celebration. In the Thanksgiving episode of the NBC show “The New Normal,” the main characters define for themselves a difference between relatives and family. While the former might represent obligation and dysfunction, places of pain or alienation, the latter are the ones with whom we choose to surround ourselves, the people who make a holiday special and sacred. I found mine, and it’s a vast and diverse family, some of whom are even related to me. This season, may your places of brokenness be places of breaking open, and may your gatherings be filled with love and laughter and the deep joy of chosen family. 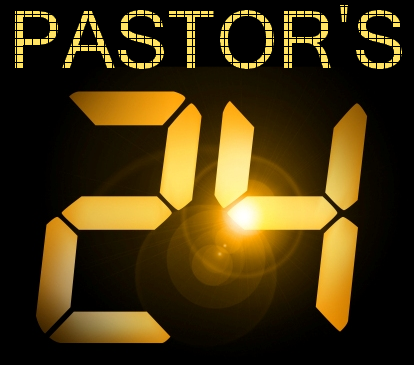 Yesterday I joined 71 other pastors in a twitter project called Pastor’s 24. It was a project suggested by my friend, colleague in ministry, and cohort in online Methodist geekdom (as of this writing, we are both featured in the blog section at umc.org, as we attempt to subvert the church with our newfangled communication ways), Jeremy Smith. Jeremy described the project in a blog post on October 19, and invited his readers to participate by posting to twitter their every pastoral action on Wednesday October 27. Yesterday, 72 pastors posted 1050 updates, providing an interesting glimpse into a day in the life of a pastor (or 72). 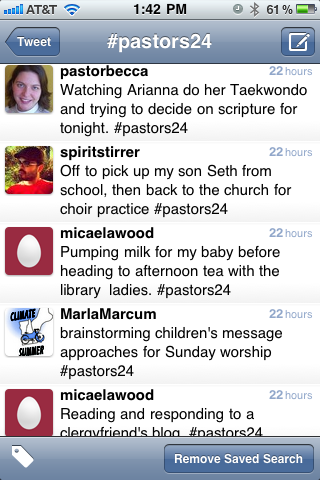 Go to twitter and the hashtag “pastors24” and see for yourself, and be sure to read Jeremy’s recap as well. I was amazed by the outcome. I thought it would be cool and kind of informative, but for me it turned out to be much more. 1. So many of my colleagues are so very prayerful, and pray in many places and in many ways. In a way I was watching people “pray without ceasing,” or as a monastic might do, mindfully work. Reading twitter and facebook, we remembered to pray for our friends, actual and virtual; in the shower we prayed for the day ahead; on our commutes, we prayed for our communities. And the rich prayer life reflected in this diverse (but let’s face it, skewed toward the twitter-using crowd) group of pastors was then pouring out in wonderful ways, providing counterpoint to the argument that the church is dying. Many tweets described meeting with people seeking baptism and membership, and several of us were meeting with, praying for, or actively working with candidates for ministry. Many pastors were engaged in work in the community with those living in poverty or great need, and several were out and about interacting with youth in their churches and beyond. The “church” was not confined to a building, and the pastors knew it, each and every one. 2. I did feel much more connected to my fellow ministers, and especially to my fellow working-parent-pastors. I was glad to hear that I wasn’t the only pastor nursing a baby at work, nor the only one who stopped work (at least temporarily) in the mid-afternoon to pick up children. I also wasn’t the only one discouraged by paperwork or overwhelmed by my to-do list, and I wasn’t even the only one who received an annoying robocall voting guide. More importantly, I wasn’t the only one who prayed while driving, or the only one who was banging her head against the social service systems to help those in need, and definitely not the only one who feels gratitude, humility, and joy (mixed with frustration and anguish at times, to be sure) to be part of this vocation. Today, I find myself missing that camaraderie, and that sense that we are all in this together. 3. I think I was a better and more intentional pastor yesterday. I was more aware of what I was doing, and which things I considered ministry. I noticed things I hadn’t been aware of before, like that I do breathe a thanksgiving each time I drive through Montpelier on my way to church because I love living and working and serving God here. And that’s prayer. I was doing things I normally do, and then excited to share them with others, not for self-congratulation, but because they–whether breathtaking or mundane–are part of God’s work. I found myself pushing to get things accomplished so they could be part of my 24 hours, and I actually got through a lot more stuff than I usually do on a Wednesday. Then I had charge conference on top of all that, but the small disappointments around that (low attendance, forgetting my planned worship liturgies) paled when seen in the gestalt of the whole day’s worth of ministry. I even felt better about the things I didn’t finish, and sent out a tweet where I gave my undone work back to God. It felt like an examen to me. The way I think of an examen may not be by-the-book Ignatian, but it is taking some time to reflect on the events of the day and determine when I felt closest to God or most connected to my calling (and sometimes, when I felt farthest away, because that’s important to know, too). What things lifted me up? For what do I give thanks? What do I give back to God? This exercise of tweeting my ministry helped me be aware of the silly things that were annoying or when I felt far from God/my calling, and the many things that were uplifting and sacred and drew me closer to God and who God is calling me to be as a pastor and a person. Which leads me to the thought, in connection with point 2 above, that I would love to continue this twitter community in some small way with those who are interested, using a common hashtag like #examen or #pastors or something to not only share our ministries throughout a day (and I do think we should make #pastors24 at least an annual thing! ), but share our common work more often and reflect on what about it lifts us up or annoys the living daylights out of us. In our shared frustrations, I found some humor and consolation, and in our shared celebrations, I saw nothing short of the laborers in God’s vineyard. 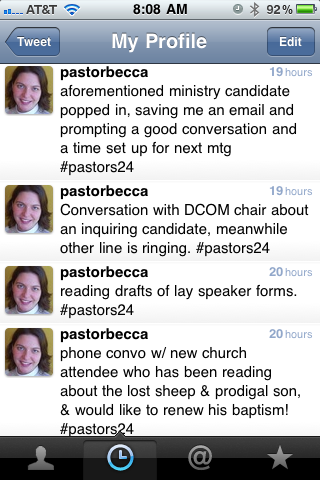 Thanks to Jeremy and all the participants in #pastors24 for this experience. I recently sat with a woman who felt more like lamenting than like praising, and together we pondered what it means to grieve, to mourn, to feel without joy or hope at times. We discussed Psalm 23, and the beautiful image of a shepherd caring for sheep, tending them, protecting them, helping them find green pastures and gentle waters. We laughed together at the foolishness of sheep and the tenderness and patience of shepherds, and we marveled at the sense of peace and trust the psalmist expresses in knowing that the shepherd protects and cares always. But we admitted that we don’t always feel that peace and trust, that safety and blessing. Sometimes we feel abandoned and alone, afraid or tormented, wounded and deeply grieved. That’s when we turned back a page to Psalm 22. This psalm is attributed to King David, as is Psalm 23. It certainly may have been written by the same psalmist in any case, whether or not David wrote it. It was attributed to one of the greatest leaders in Israel’s history. It was included in the scroll of the psalms, the hymn book of the Israelite people. It is included in the Jewish and Christian scriptures. It is a sacred and revered text. And yet, we don’t read it to comfort ourselves, or to speak aloud our faith in God at the beginning of a memorial service (when perhaps it would be far more appropriate than the oft-quoted psalm 23). We don’t necessarily consider it to be a comfortable or affirming passage to read, and yet there it is, right next to one of the most beloved scriptural passages of all time, sharing pages with a psalm people turn to in the face of grief, and here is one of the most authentic articulations of doubt and despair and need for hope and healing. It is not considered shameful or faithless; it is sacred song, no less than its sister-song, one chapter later. Both psalms are tied to the life and witness of Jesus as well. The one who was called the Good Shepherd, spoke the opening verse of psalm 22 from the cross. Jesus is both the one who affirms our sense of trust in God to shepherd and guide us, and the one who cries out “My God, My God, why have you forsaken me?” If David can experience both, if Jesus can embody both, are we so surprised that life is so often both, so often pain and praise, lament and elation, abandonment and trust, pressed together, chapter after chapter, page after page? Today, our house was flooded with family and friends to celebrate our impending new arrival (six more weeks!) 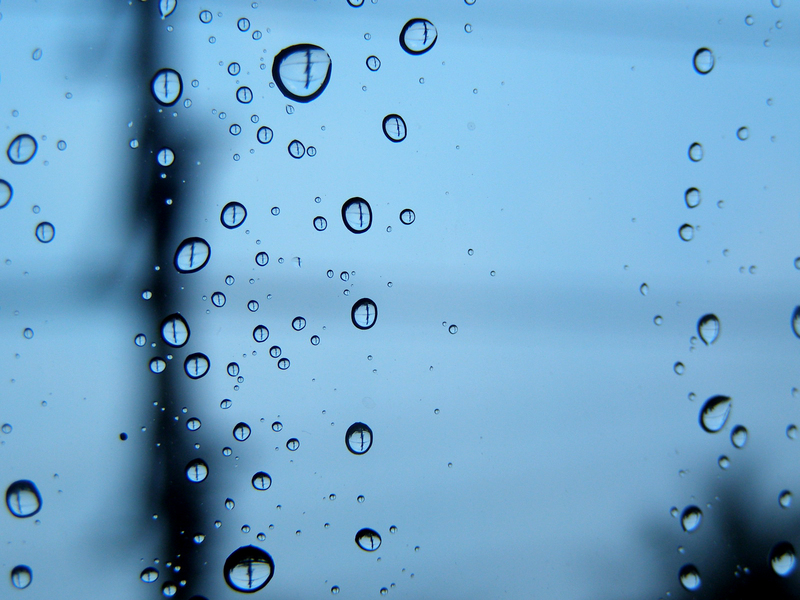 with showers of love. We delighted in one another’s company, we laughed and played, and hugged each other tightly when we parted. We were blessed. There was another family invited to the shower, but they could not come. Crystal and Jim and their daughters have been like family to my sister and I since before we were born. When we spent holidays together, my sister and I would call Jim “rent-a-dad,” since we were there without our dad, and so he filled in for all four girls. Jim was a witty, funny, brave and strong man. He fought a war, he battled addiction, he built a house, he worked with inner-city youth, he raised a family and then some. But cancer doesn’t care about any of that. Two hundred miles away, my rent-a-dad Jim passed away this afternoon at about 2 o’clock. His wife, daughters, son-in-law, and granddaughter were all at his bedside. Another song, another part of life, pressed together, page after page, chapter after chapter. I feel like I missed a lot of Conference. Or maybe it’s just that it’s blurry and I only remember the big things. I preached Wednesday night for the opening memorial service, a tremendous honor that had me sweating glowing like crazy and more nervous than I remember being. Of course the actual sermon was not exactly like the rehearsal recording I uploaded, but it may have been close. I never felt like I totally got into my groove, but I also heard from literally hundreds of people that they loved it and were touched by it and needed to hear it, so maybe, jut maybe, God spoke a Word despite me. God tends to do that. I spent much of Thursday coordinating, between legislative sessions, with a friend coming in late. Friday was similar but coordinating with family coming in for Saturday. And then there was Saturday. Closing motions– our *last* full confernece closing motions. Friends crying right and left, me stealing other people’s tissues (sorry, Megan), and all before we even got near the Ordination service. The service was surreal. My family sat right behind me, and I was between my two fellow ordinands. In some ways it flew; it seemed tailor made for me, the sermon, the people involved, the music– the anthem was “In the Midst of New Dimensions,” a favorite song of mine from which this blog takes its title. And before I knew it, my sponsors were on either side of me, my DS had offered me his arm, and I was walking to the stage, kneeling before the bishop, hearing the rustle in the room as people got to their feet. And then three bishops, two board members, the conference lay leader, my District Supeintendent, my mom in law and my mentor all placed their hands on me. There’s no way to describe it, but I’ll try. A day before, I received a back massage from a woman who has studied reike. Her hands were incredibly warm and strong. These hands were warmer. They pressed down almost as hard as she did. I expected it to be like other ‘laying of hands’ I had experienced, where people lightly place their hand on you, barely applying pressure. Here was pressure, weight. This was serious prayer, like when you grip a friend’s hand for dear life. I think I let out an audible gasp. And then (although I tried to stand up because I was in such a haze) my hands were placed on a bible, but I was looking right at the Bishop’s face, and her eyes were bright with moisture. As I stood, I had to stoop to accept the stole from her, and it raised goosebumps on my neck. I stayed on the platform for the rest of the service, and then we consecrated communion together, breaking bread and sharing liturgy (and book-holding confusion) with the three bishops like we were all colleagues, because, guess what, we are. I broke bread and placed it in people’s hands, calling them by name, grinning like a Cheshire Cat, I’m sure. During the call to ministry, several people I knew came forward, and I didn’t have enough arms to hug them all. We recessed, and then the line of clergy, men and women I respect and admire and adore, shook my hand and greeted me, and it was in their eyes: despite the differences in age and experience, they greeted me as an equal. I presided in worship on Sunday, twice, with a stole around my shoulders, conscious of the weight, but feeling right and at home. I’m not a stuff person, and I don’t go asking for gifts a lot. But I feel like this might be a good occasion. I’d like you to give me something. Nothing huge, and preferably something that can be sent by email or explained via phone call. A poem. A picture. A prayer (I’m specifically looking at you, E.D., because you know how I love your prayers). Some of you have honored me with a gift already. C.Z., your concert dedicated to me counts. T.V., your quote counts. G.D., your email, which you thought communicated nothing except that you didn’t know what to say, that counts. I’m collecting these little treasures, and they help honor, grieve, and celebrate the little treasure I lost. Consider it a shower, a non-baby shower, a showering of love. Consider it me doing a rare thing– asking for help. At the family/friend gathering where I often celebrate Thanksgiving, we have a tradition at the beginning of the meal. Each person sits down to a plate with three popcorn kernels on it (I’ve realized recently that, as microwave popcorn is the only kind I know how to make, this is tough to replicate at my own home!). For each kernel, the person names one thing for which they are greatful. I don’t know when we started this practice; it’s been part of my Thanksgiving since I was a child. 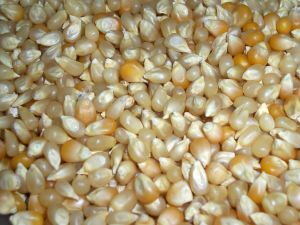 While its good to try to focus on just three things, sometimes I am overwhelmed by blessings, and feel like I need a whole handful of popcorn kernels. To be sure, I can do my fair share of complaining, but I also think I’ve been richly blessed. So this year, I am thankful for this strange life of mine, how different it is from anyone else’s, how unique and short and precious it is, and what a gift from the Holy. I am thankful secondly for the people in it, for my remarkable husband who puts up with a great deal and faces each day with new excitement, for my amazing and utterly surprising daughter, who keeps me on my toes and comes up with new ways to delight and challenge at every turn, for my family– including in-laws– who get along with one another and celebrate together, for my friends, many of whom are farther away than I’d like, whom I miss terribly, for my church communities whom I am just getting to know. Finally, I’m thankful for the blank slate that is the future, the unknown blessing in this time and place, the friendships yet developed, the ministries on the horizon, the small and large joys undiscovered that will be next year’s handful of popcorn kernels. For what are you thankful this week?